Youth had only 2 hours to design a bridge that would support a semi load of vegetables. When you hear the word agriculture, it probably evokes words like “farming, livestock or dirt” and maybe even the smell of manure. For people who work in the agriculture industry, it reminds them of words like “hard work, long days, sweat” and the smell of money. But did you know that science and technology- especially engineering- play an ever increasing role in supplying our nation (and world) with a safe and affordable food supply? 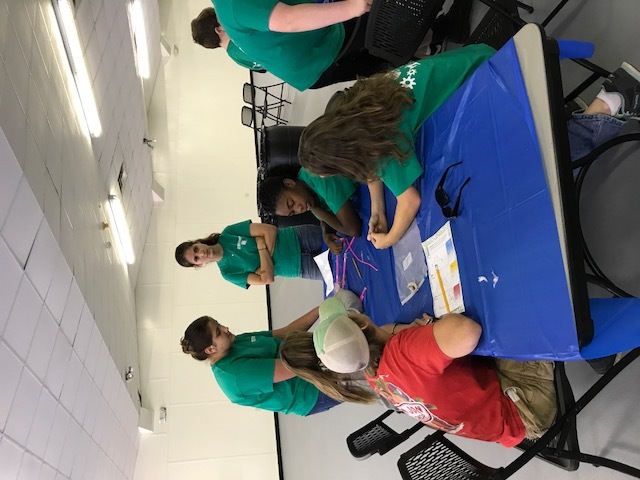 Thanks to generous support from HughesNet, 4-Hers across Florida have been learning just how much the agriculture industry needs technology. 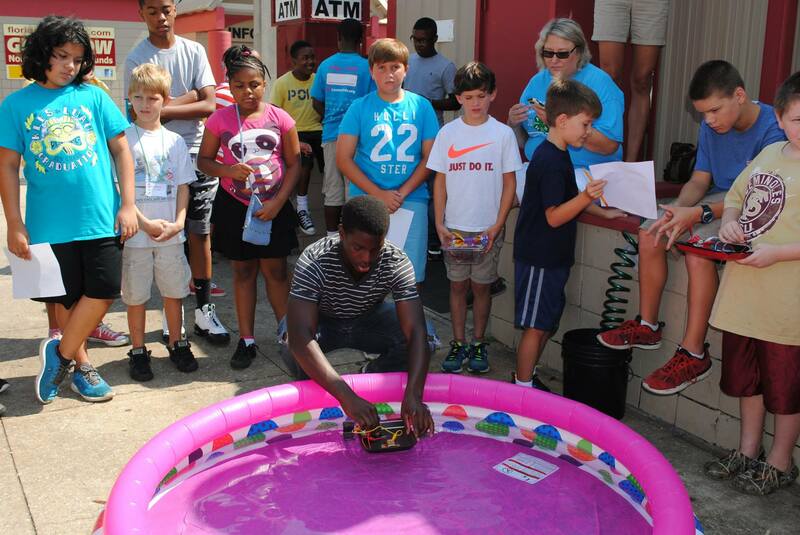 This week, 4-Hers from Jackson, Liberty, Gadsden and Leon counties participated in an engineering day camp. Each day, they learned how civil engineers design the infrastructure needed for farmers to get their food from the farm to tables across the state and nation. The program concluded with an engineering challenge at the North Florida Fairgrounds in Tallahassee. Youth were judged on their innovation, creativity and teamwork- all essential skills for engineers who solve today’s problems! Youth had two hours to design, build and test a bridge that would hold a large semi-truck of produce. The results were inspiring! Teams were judged on their creative use of materials, innovative design, teamwork and communication skills. 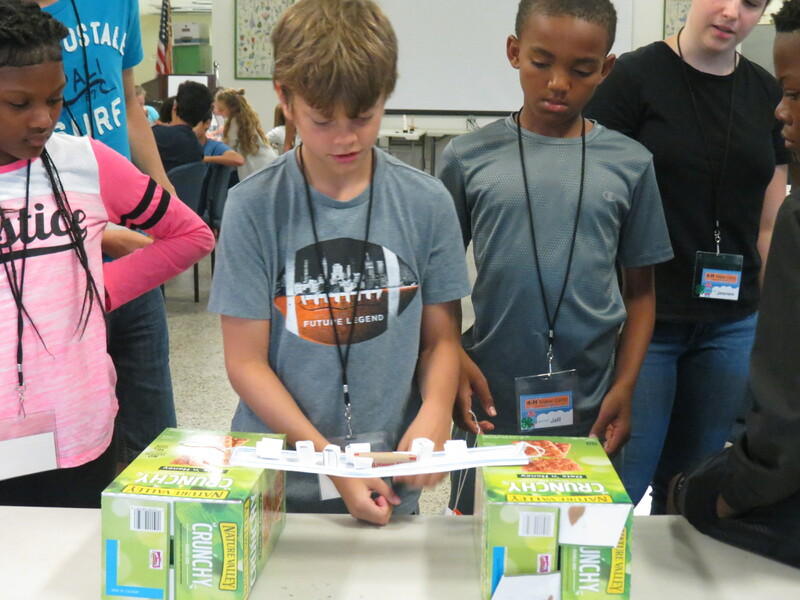 They also completed a skill-a-thon to showcase their knowledge of bridge design. This challenge was practice for the contest that will be held in November during 4-H Day at the North Florida Fair. To find out more information about other 4-H programs like this, contact your local UF IFAS County Extension Office or visit http://florida4h.org. 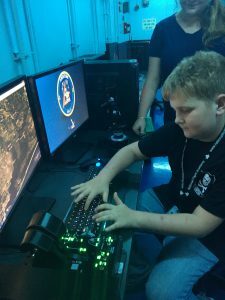 4-H has joined forces with the National Flight academy to bring a unique and exciting aviation camp to our 4-Hers. 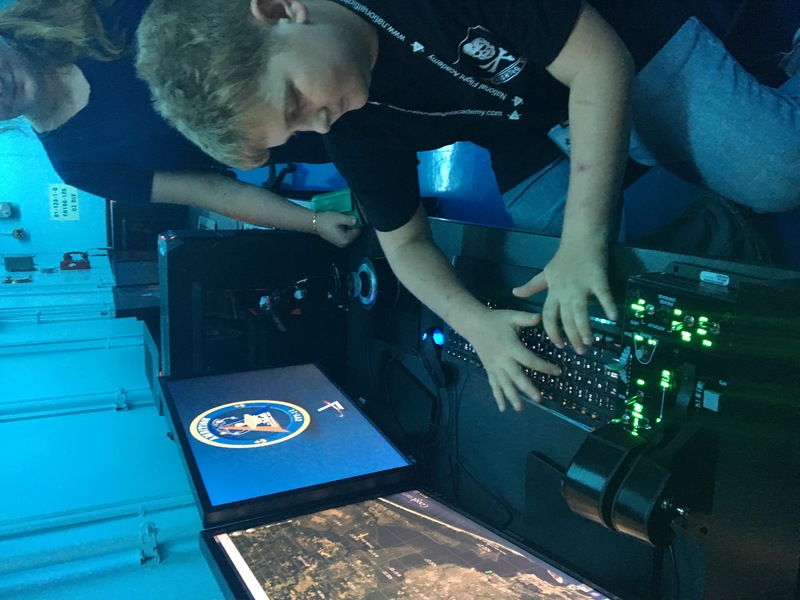 The National Flight Academy builds heart-pumping, adrenaline-filled story line, which brings life to a mission as if the students are in a real-world scenario. Students apply these skills by flying the high-performance X-12 Triad, the National Flight Academy’s experimental aircraft, offering them hands-on comprehension of the principles of flight thrust, hovering and target drops. Our 3-day cruise will be held on President’s Day Weekend, February 18th – February 20th 2017. The event is open to 4-Hers across the Southeast and costs $375 per student which includes rooming, food, and a lot of fun and learning! This would be an awesome holiday or birthday gift for any special youth in your life. Click Here for registration instructions: 4hregistrationletter-for-nfa. You must be registered before January 28th, 2017. 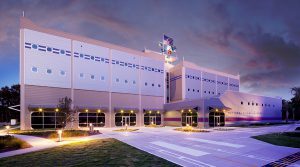 The National Flight Academy is located on the NAS base at 1 Fetterman Way, NAS Pensacola, FL 32508. See more about the academy at http://www.nationalflightacademy.com. 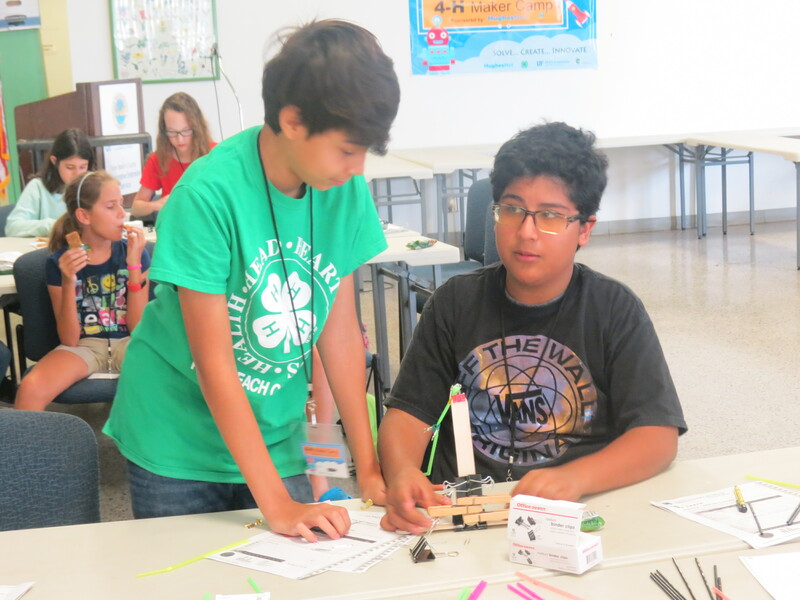 If you have an interest in science, engineering, math, and/or technology (STEM), consider becoming a 4-H volunteer so that you can share your passion to spark the next generation of scientists, engineers and innovators. Contact your local UF IFAS County Extension Office or visit http://florida4h.org for more information. More than 60 youth participated in the district Junk Drawer Robotics Challenge this summer. Everyone has a measure of creativity in them but how we express our creativity is our choice. What is creativity? I am glad you asked. Creativity is defined as the ability to make new things or think of new ideas. Creativity can be expressed in a tangible or intangible way. It is also the ability to take something known and present it or use it in a new way. So how does Florida 4-H grow creativity in our youth? Well, you know I am glad you asked that too. 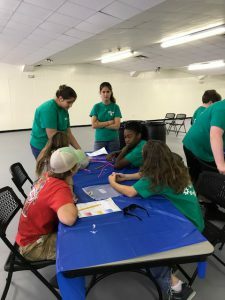 One way is that Florida 4-H provides opportunities for youth to express their creativity through their project work in one of the national 4-H initiatives: 4-H Science, Healthy Living, Citizenship, and Mentoring. One of the ways that Florida 4-H is growing creativity is through our Junk Drawer Robotics Program. 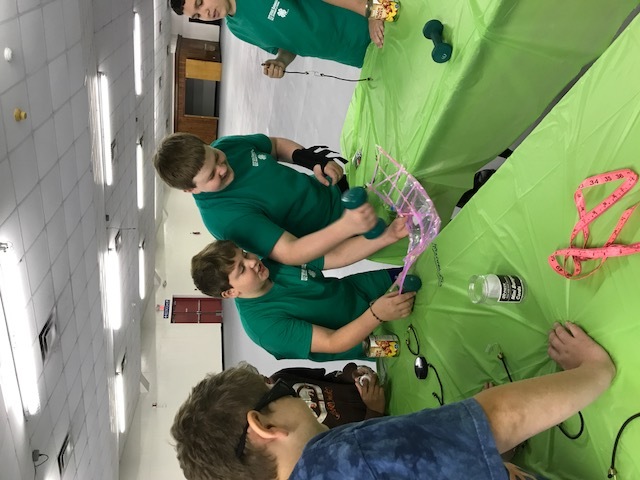 The 4-H Robotics Program is designed not only to teach youth about science and physics, but also the engineering design process. Every good engineer is creative! Several counties offered a day camp this summer to teach youth about forms of energy, gears, motors, switches, circuits, and pulleys. Then, they were given everyday “junk” to build a robot and make it move or complete a task using the science concepts they had learned. Youth worked in teams and used their creativity and curiosity to design, build, and test their robotics. 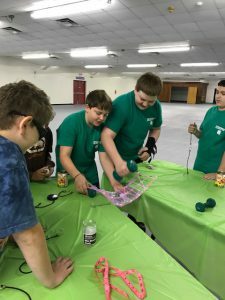 Youth came together for a district challenge in July and will also have the opportunity to compete November 14th during 4-H Day at the North Florida Fair at the Junk Drawer Robotics Contest. Last year, more than 20 teams competed to build robots that could paint out of scrub brushes, solo cups, and toothbrushes. Florida 4-H is sending a team of youth and volunteers to the National Maker Summit in Washington, DC November 7th. The Maker National Youth Summit is for the creative and curious young minds of the next generation of innovators. Participants make what they can with a variety of materials from a range of fields, utilizing their resourcefulness and creativity. 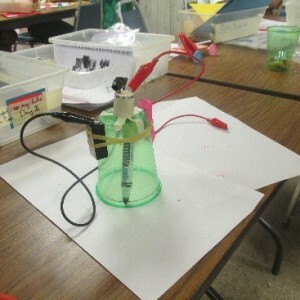 That same weekend, a 4-H Tech Wizards Team will be hosting a SeaPerch Challenge during the 4-H Marine Ecology Event. SeaPerch is an underwater remote controlled robotic platform that Florida 4-Hers can participate in. Engaging in Florida 4-H from the county to state levels opens an array of opportunities for creative expression via leadership roles, volunteer service, public speaking, teaching, photography, talent showcase, culinary arts, and many other areas. Learn more about opportunities for youth on our webpage or watch this month’s Make a Difference Monday volunteer training on how to Navigate 4-H Events and Activities. There are many opportunities with Florida 4-H for creativity expression but did you know many youth will not have the chance. Why, you ask? I am definitely glad you did. We need more adults who will be committed to the positive youth development process that happens with 4-H to become a club volunteer. Working with the local 4-H Agent as part of the leadership team, you will find many avenues as well for creativity expression and growth as you help local youth; “Make their Best Better.” Learn more about our volunteer opportunities with Florida 4-H: http://florida4h.org/volunteers_/ or contact your local UF IFAS Extension Office. 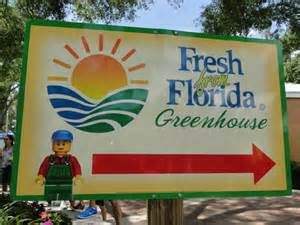 The Florida Department of Agriculture Greenhouse is a must-see attraction at LEGOLAND. You are responsible for your transportation to and from the park, and for making any reservations for overnight accommodations. Many of the hotels in the area offer free shuttle services to and from the park, so ask your hotel concierge. The onsite LEGOLAND Hotel recently opened and is offering some great deals. 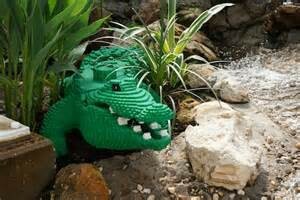 If you are driving to the park, parking costs $14.00, but you can save $2.00 if you order your parking pass online http://florida.legoland.com/. For information about park attractions, show schedules, food, height restrictions, or accommodations for persons with disabilities visit http://florida.legoland.com/.